WINE buffs can broaden their knowledge of wine in general as well as best wine-and-food pairing, and enjoy some other tastes of the better things in life, with a sailing next April aboard the world's highest-rated boutique passenger vessel, SeaDream I that'll offer a world-recognised wine education diploma course. 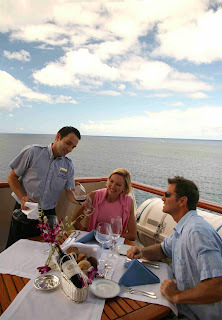 And with current bourgeoning interest in wine-and-food appreciation, eight other sailings in the Mediterranean aboard the mega-motor-cruisers SeaDream I and SeaDream II in 2015 will allow guests to meet with eminent winemakers who'll be aboard. At these meetings they'll also enjoy free tastings of the maker's wines, and if they wish take part in optional visits to some of Europe's most prestigious smaller and historic wineries. "We have been approved by the world's most-respected wine education organisation, the British Wine and Spirits Education Trust (WSET,) to deliver their in-depth Level 2 Course that provides the opportunity to achieve a WSET Diploma in wine education," said SeaDream Yacht Club's owner and CEO, Atle Brynestad. Mr Brynestad has just appointed one of Scandinavia's most-respected wine writers, Erica Landin as Director of Wine to develop its new onboard programs. The eight Mediterranean sailings that include the free wine tastings and optional-cost winery visits (US$150pp per winery,) will be priced from US$3704pp twin-share for 5-days from Monte Carlo back to Monte Carlo in May 2015. All sailings include award-winning cuisine, premium lunch and dinner wines, bar drinks, water-sports, port charges and taxes, and gratuities. *The course will include two 1.5hr sessions daily focusing on key grape varieties, growing methods and factors influencing a wine's style and quality, accompanying tastings, and an overview of major wine regions from Europe to Australia, New Zealand, the USA and Argentina. There'll also be a visit to a major winery on Madeira with a vertical tasting of very old Madeira wines, a Champagne Master Class, and food-pairings with SeaDream's most-loved dishes.